"Hi Norman, Just a quick note to let you know that my order has arrived already! 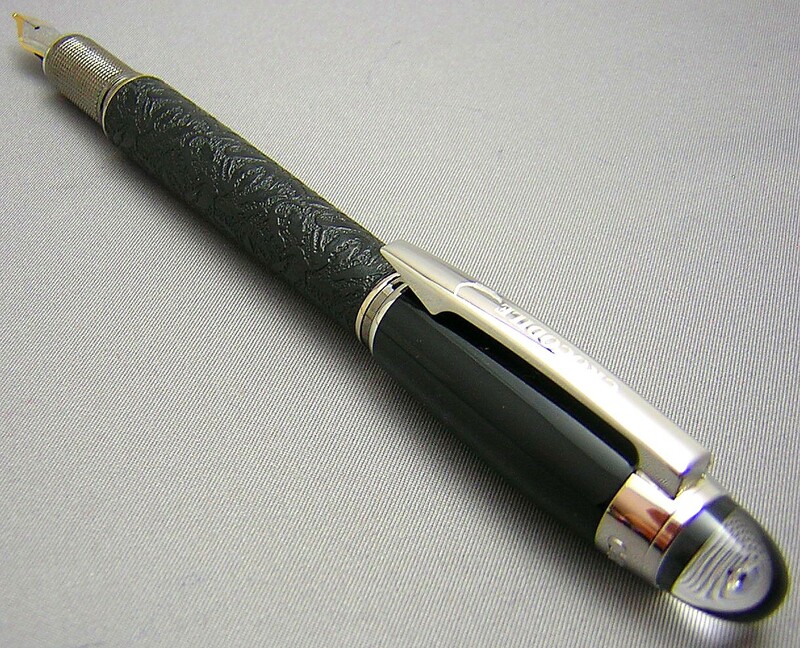 I fell in love with the Conklin when I saw the picture, but it is even more beautiful "in real life". I've inked it up with Noodler's Ottoman Rose and it is writing beautifully. It might take me a little time to get used to the feel of the Crescent "bump" but it is so lovely to have on my desk that I am sure it will soon be a regular. 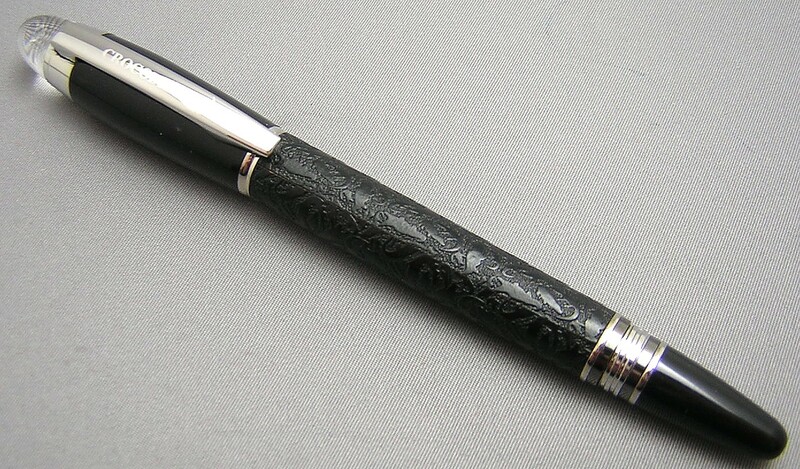 The Crocodile Crystal Leather is also lovely. It's got a surprising weight to it for such a small pen, which I really like (kind of like shopping for papayas - they always recommend fruit that is "heavy for its size"!) and I love the feel of the textured grip in my hand. The screw-on barrel for posting the cap is great, as it feels very secure, although I do prefer it unposted at this early stage. 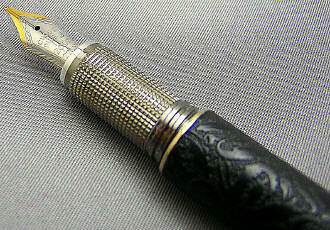 Another great-value, great-looking everyday pen. Thanks once again for the fabulous service and the lovely merchandise!" 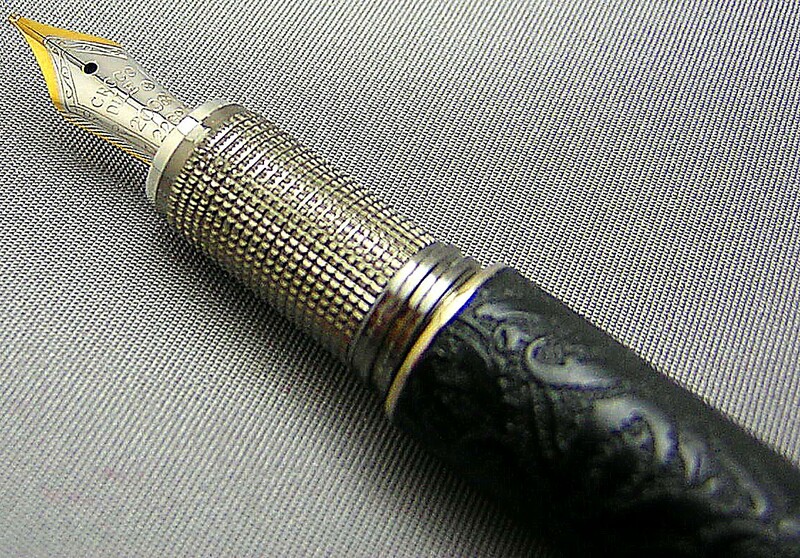 The Crocodile pen company once again looks to Germany -- and a certain well-known manufacturer -- to pay homage to one of their iconic designs. If this design looks familiar to you from elsewhere on the website, that's because I've been carrying the Baoer version for several years, which I call the Black Rectangles. As can be seen when the pens are laid side-by-side, they are virtually the same size and give a similar appearance...but there are differences! 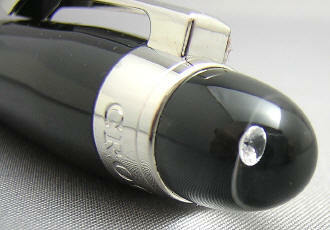 Although slim, the Crystal Leather is still a full-sized pen. 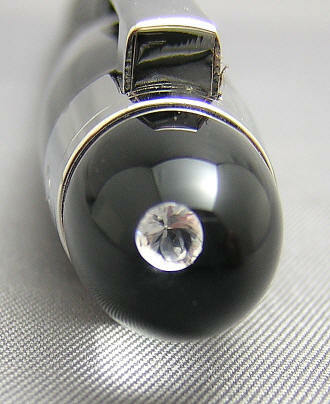 It measures 5-1/2" capped, 6" posted and 5" with cap held aside. The most noticeable differences when held next to the Baoer version are two-fold. First, the Crocodile model has a barrel wrapped in tooled leather, displaying a large number of cavorting crocodiles . Second, although the Baoer no longer displays a floating logo (read more about that on it's page, linked above), the Crocodile proudly displays a floating crystal in place of the original pen's snowflake. The Crystal Leather's clip ring is engraved with 'Crocodile', as is the clip itself -- along with a small, textured crocodile -- should you have any doubt as to the manufacturer! 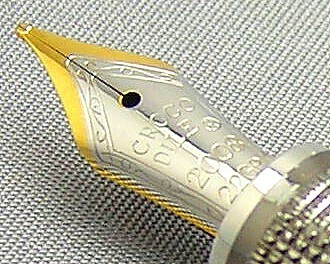 Unscrewing the cap -- which can also screw on the barrel should you wish to post it -- displays the knurled gripping section and two-toned 22K gold-plated steel nib. The section is very comfortable to grip and provides nice traction to one's fingers. 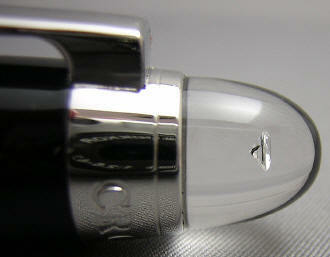 I'd rate the nib a light medium, meaning it's between a typical western fine and medium in my judgment.